Lou Hamilton is an artist and multi-award-winning filmmaker. She is also the author & creator of the book of illustrations “Brave New Girl” published by Orion Spring 2016 & the self-coaching book FEAR LESS published April 2018. 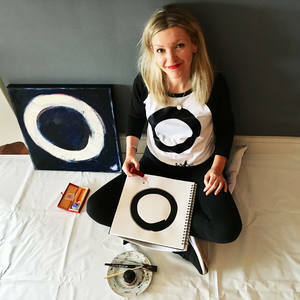 She makes abstract paintings, which aim to help create quiet, meditative spaces to live and work. 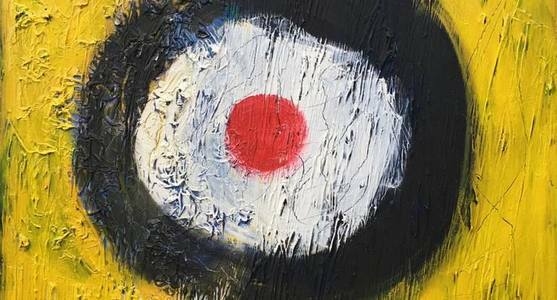 Concerned mainly with the abstract & working with found materials, oils, inks, plaster & acrylic, Lou is currently exploring chaos & calm through circles and all that they symbolise. Whether on paper, canvas or t-shirts, they give a lens through which to view the world, a moment to stop, pause & consider Lou’s grand-father was the figurative painter Geoffrey Tibble 1909-1952. He was one of the distinguished & influential group of artists that emerged from the Slade at the of the 1920’s and was a member of the Euston Road School of Painters. His work can be seen at the Tate, and is in many collections around the world. A major retrospective of his work “Wives & Daughters” took place at the Jonathan Clark Fine Art Gallery in 2002. Lou grew up in the wild, open and ancient landscape of Wiltshire, and every year since childhood has spent summers amongst the scorched, saturated colours of South of France. For five years she lived and painted in the Lake District, Cumbria and South West Scotland. Now she has settled on an Island in London, surrounded by water and the sun’s reflection on the surrounding glass-clad buildings. The light and colours are an ever-changing source of inspiration. She continues to visit Dordogne and Provence every year but also in more recent years her travels have taken her to the awe-inspiring landscapes of China, India and the red rocks of Sedona USA. She regularly goes to Cornwall to paint. As a result Lou’s paintings are inspired by landmass, water, light, flags & urban textures. They might appear as simple bands of colour, in a 3-act structure, that bely the depth of surface. Or in large square with hints of underpainting showing through the cracks. She has recently become increasingly drawn to the Japanese reverence for the simple vessel but Lou upends our view so that the images often resemble an abstracted target, or a simple circle. More and more her works are a symbiosis of painting & drawing with her character Brave New Girl making an appearance with marks & lines trailing across the surface. Working first with vigorous, energetic textural strokes in acrylic, then manipulating the surface with veils of oils mixed with organic walnut oil, medium & sometimes plaster, she builds up layers until they start to resonate and ‘hum’. At that point she knows she’s hit the sweet spot. Her aim is to create a deep expression of landscape or city walls or simple life objects at an elemental level. Her favourite artists are Sean Scully, Mark Rothko, Edward Hopper, Jasper Johns, Anton Tapies, Agnes Martin, Richard Deibenkorn & James Turrell . M.A. Public Art (Distinction). Chelsea College of Art, London. Dip AD. (Distinction). Dip. Fine Art Byam Shaw School of Art London. Soho Solo Show "FREEZE FRAME" a 6 month exhibition at The Farm HQ William Building, W1. Her work shows monthly in the Discerner magazine and their quarterly events.